2008 Collection of paintings for Seabird Explorations office in Dubai, UAE. 1992 Collection of paintings for PGS Exploration Inc. office in Houston, Texas. 2002 "Vi Maler Norsk natur"
2012 "International Contemporary Masters" Volum VI . 2015 Barcelona, Spain- from July 1 TO JULY 15th. More info will come later. The German Expressionist painter Wassily Kandinsky stated, “Color is the keyboard, the eyes are the harmonies, and the soul is the piano with many strings. The artist is the hand that plays, touching one key or another, to cause vibrations in the soul.” The contemporary artist Anne Lise Kaaby’s unique style intermingles Avant-Garde techniques to create harmonious compositions brimming with prismatic color, topographic texture and surreal intrigue. Anne Lise Kaaby’s expressionist style comprises an inter-mixture of inspirations and techniques, stating, “My expression is a combination of music, humor, surrealism and cubism. My working method is often mixed technique, where I combine acrylic and collage, creating a surface that is pleasing and brings the viewers’ attention to explore the several levels of this process.” Ms. Kaaby’s cubist inspiration combines both the analytic and synthetic periods, reducing figures to geometric simplicity and collaging found materials into the picture-plane. Her mixed-media creations echo musical melodies, where pools of kaleidoscopic colors comingle and juxtapose against bold, saturated lines forming geometric and organic shapes, dynamically building topographical layers engendering energetic textures that ignite the senses. Surreal figuration stimulates humorous scenarios, eliciting through poetic titles imagery of “Young Lovers” and “Lifelong Journey’s” through mysterious territories. Ms. Kaaby’s surreal compositions visually inspire viewers through her melodious brushstrokes, sensational color planes and enchanting compositional harmony. The award-winning artist Anne Lise Kaaby was born and raised in Porsanger, Norway. The artist now works and resides in Dubai. Ms. Kaaby received formal art training in the United States, attending the North Light Art School, University of Houston and the Art League of Houston, Texas. She exhibits internationally, with group and solo exhibitions throughout Norway, U.A.E., and the United States including Texas and New York City. 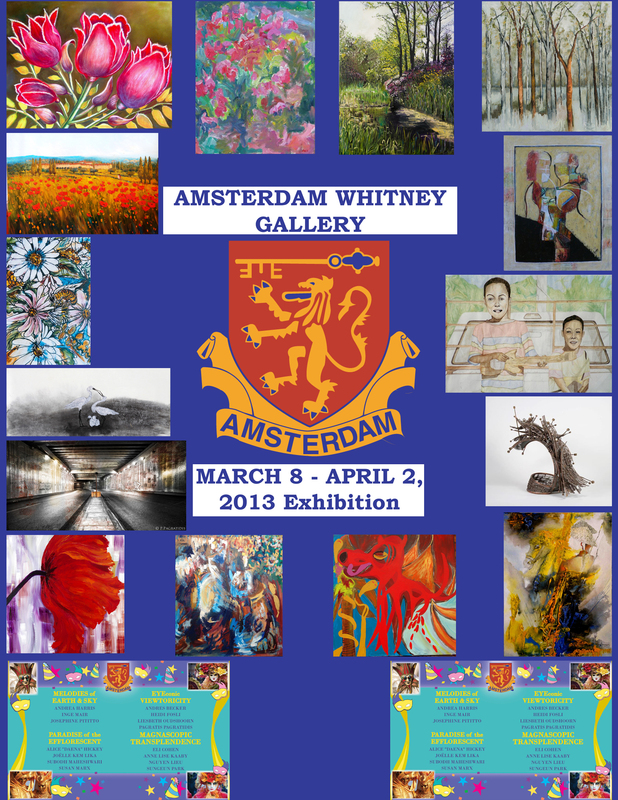 Her artwork is treasured in many public and private collections world-wide, and Amsterdam Whitney Gallery is proud to showcase the art of this contemporary artist. 2014 "The Art of the future in the hall of the past"
2014 Stuttgart: italian Cultural Institut, 14 November-20 December. AMSTERDAM WHITNEY GALLERY, 511 West 25th Street, Chelsea, New York City, is proud to showcase in its MARCH 8- APRIL 2, 2013 Exhibition and special“Masquerade Magique” Fête on Thursday, March 14 leading Contemporary Master Artists whose mesmerizing works explore the abstract, figurative and natural worlds, exalting the magical realm of the aesthetic through brilliant coloration and dazzling form. This special Spring exhibition offers a visual bouquet to delight the senses of both art acquisitiors and art aficionados, entrancing the apex of excellence while offering a fantastical international perspective to the representational and non-representational realm through spellbinding artistic interpretations of the world. 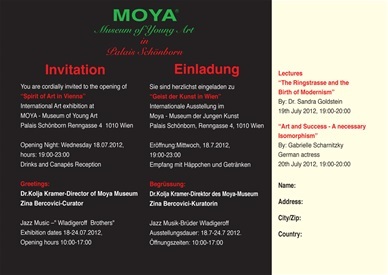 The Private View is by invitation only. During the inauguration there will be a charity auction in favour of charities supported by the Rotary club - the Salvation Army and Rotary’s “End Polio Now” Charity. As auctioneer for the charity auction, we are honoured by the participation of Nicholas Bonham. Bonham’s Auction House is seen as one of the most important auction houses in the world, rivaled only by Sotheby's and Christie’s. Lots will include an original drawing by Andy Warhol, an original drawing by Giorgio Armani, the Italian designer, and other artists. The Mayor will attend the exhibition and will present the funds raised in the charity auction to the Charities during a ceremony that will see aN important participation from the Salvation Army. The Salvation Army Brass Band will accompany with music. Artists selected for the London Art Biennale are invited to the Gagliardi Gallery for an evening of music, wine and typical Italian food. The ship is called the Elizabethan and is the same vessel that was used by Kate Middleton’s family during the Diamond Jubilee of Queen Elizabeth’s reign - a historic event that saw over 1000 ships, the largest ever fleet to travel the Thames. The ship is a perfect replica of an 1890s Mississippi Stern-wheeled Paddle Steamer and beautifully reflects the style and craftsmanship of that bygone era. The Elizabethan is one of the largest vessels on the Thames and will prove to be a perfect vantage point to see the wonderful London landmarks such as the Tower of London, Tower Bridge, Parliament and the City of London. In fact, the Anglo-Italian Academy of Art, in collaboration with the Chianciano Art Museum are inviting artists to absorb the colours and atmosphere of the water and of the sky during the journey. 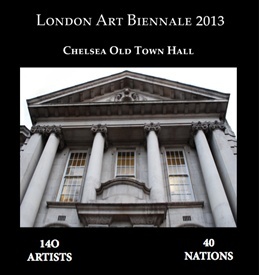 Artists have until the 31st of March to create an artwork inspired by London and one work will be used for the front cover of the Biennale of Chianciano 2013 publication. You will embark at 3pm at Chelsea Harbour pier, near the Chelsea Old Town Hall and the Gagliardi Gallery. The ship will take you through London in daylight and will return after sundown so that you can see the landmarks in both the day and the night. You will then disembark at the Tate Britain Museum at 6pm - the museum closes at 10pm and will be a nice way to finish the day for those of you who wish to go. Group Exhibition : "Christmas EXPO"
Hello friends. 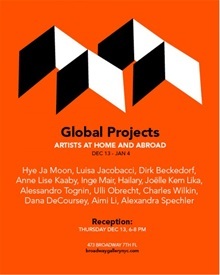 I am participating in this exhibition in Florence. Please visit the gallery if you have a chance. Hei venner. Jeg deltar på denne utstillingen i Firenze, Italia, så er du i nærheten så ta deg en tur innom galleriet. Mostra "Love"-Galleria Tondinelli Roma- S.E. Joseph Tebah-Klah, Ambasciatore della Costa d’Avorio presso la Santa Sede, la gallerista Floriana Tondinelli, le artiste Kari Elisabeth Haug e Anne Lise Kaaby Aas, Katerina Georganta. Show "Love"-Rome-His Excellency Mr Tondinelli Gallery Joseph Tebah-Klah, Ambassador of Côte d'Ivoire to the Holy See, Floriana Tondinelli the gallery, the artists Kari Elisabeth Haug and Anne Lise Kaaby Aas, Katerina Georganta. 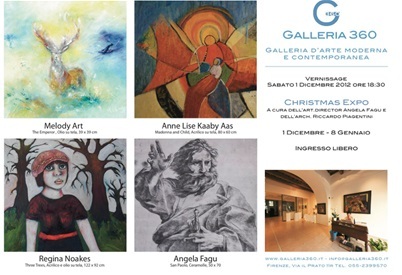 La Galleria Tondinelli presenta dal 9 al 29 febbraio 2012 la mostra LOVE con opere di Anita Fleerackers, Katerina Georganta, Kari Elisabeth Haug, Anne Lise Kaaby Aas, a cura di Costanzo Costantini e Floriana Tondinelli. La mostra vuole tracciare un percorso sul tema dell’amore attraverso alcune espressioni artistiche varie e rappresentative di una visione romantica, passionale, melanconica, platonica del discorso amoroso. La cultura italiana ed europea è intrisa del tema dell’amore e delle sue rappresentazioni sin dai tempi più antichi, l’arte moderna prosegue con diverse interpretazioni, mettendo il segno focale su opere che sono capolavori assoluti; tra gli autori più significativi del 900’ che interpretano l’amore, Chagall. Anche nell’arte contemporanea sono molti gli artisti che s’ispirano a questo tema, e lo rendono più che mai attuale nella ricerca dell’altra metà, nella conoscenza del corpo e della mente, nell’esaltazione dei sensi, nella contemplazione di un volto. Anita Fleerackers, nata in Tielen, Belgio. Si diploma a l'Academie Royale de Beau's Arts d'Anvers in Belgio. La sua fonte d’ispirazione è la comunità in cui vive, le persone che conosce, vedere nel profondo del loro animo, come dice l’artista, la fa essere in equilibrio in questo mondo frenetico. Le ceramiche policrome che sono in mostra hanno come soggetto il Tango, ballo elegante e passionale che parla di sentimento, corteggiamenti, gelosia e possessività, una conversazione senza parole. Le sue opere sono state esposte a Firenze, Belgio, Inghilterra, Marsiglia, Parigi. Katerina Georganta, nata ad Atene, Grecia. Studia pittura all’Athens Fine Arts e all’Ecole des Beaux Arts a Parigi. L’amore romantico è il tema principale della poetica di Katerina Georganta, l’incontro tra l’uomo e la donna, la composizione della scena a due, culmina nel bacio languido e appassionato. L’amore si esprime nella bellezza dei corpi, nella stesura del colore acceso e vibrante. L’artista è considerata una delle più interessanti nel panorama contemporaneo greco, le sue mostre dal 1976 si sono susseguite in tutto il mondo. 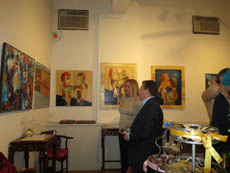 Le opere sono in diverse collezioni a Cipro, Parigi, Londra, California, Miami, Chicago, Francoforte. Kari Elisabeth Haug, nata a Oslo, Norvegia. La pittura è la sua forma di espressione più importante ma anche il pianoforte e la poesia sono fonte d’ispirazione. Il carattere informale delle sue opere si manifesta con l’uso sapiente del colore. Una forza espressiva magmatica che avvolge in un vortice i sentimenti dell’essere umano, la bellezza della natura. L’artista è spettatrice del manifestarsi dei sentimenti umani la metafora del ponte, dell’illusione, assistiamo alla sublimazione dell’amore. Diverse sono le esposizioni internazionali a cui l’artista ha partecipato: Oslo, Parigi, Salisburgo, Las Vegas. Anne Lise Kaaby Aas, nata a Porsanger, Norvegia. Ha lavorato e vissuto negli Stati Uniti, ora vive e lavora a Dubai. Studia pittura alla North Light Artschool a Houston. Anne Lise Kaaby Aas è attratta dalla realtà che la circonda, scene di vita quotidiana sono i suoi temi preferiti, ma anche la natura, i sentimenti, la spiritualità. Le opere dedicate al tema dell’amore hanno un carattere meditativo, contemplativo, in alcuni tratti melanconico, c’è la bellezza dell’incontro e la nostalgia del ricordo in un altalenarsi di emozioni. Le sue opere si trovano in diverse collezioni pubbliche e private in Danimarca, Norvegia, Stati Uniti, Italia. La Galleria Tondinelli presenta dal 9 al 29 febbraio la mostra 'Love' con opere di Anita Fleerackers, Katerina Georganta, Kari Elisabeth Haug, Anne Lise Kaaby Aas, a cura di Costanzo Costantini e Floriana Tondinelli. L'esposizione vuole tracciare un percorso sul tema dell'amore attraverso alcune espressioni artistiche varie e rappresentative di una visione romantica, passionale, melanconica, platonica del discorso amoroso.